The handful of humans that crash-landed on Pearseus three hundred years ago, have now colonized a large part of the planet, rebuilding their civilization from scratch. In the process, they have created a dystopia for themselves, splitting into three competing factions: the Capital, the Loyalists and the Democracies, all embroiled in endless intrigue and constant warfare. Peace of the Eclipse, an uneasy truce between the three parties, still holds – barely. While man turns against man, the First, Pearseus’ indigenous people, wage their own ancient war against a shadowy enemy; a war that threatens to destroy all of humanity. The story unfolds through the eyes of its protagonists. Egged on by unseen forces, Styx, the increasingly paranoid ruler of the Capital, terrorizes her subjects. In a burst of cruelty, she murders General Parad’s son and feeds him to his father during a banquet. David, a young servant of Styx, accidentally finds out about the planet’s ethereal inhabitants and is forced to flee the Capital. Lehmor and Moirah, a recently married First couple, are caught up in humanity’s scheming. And in the Democracies, Sol becomes ruler of the city of Anthea, determined to lead it into glory. As war looms ever closer, the protagonists find their lives in danger at every turn. Can love be found in the ruins of humanity’s civilization? This book benefited from the bump that I give anything I would give a half star since I also post these on Amazon and Goodreads. For me, it was a solid 3.5 stars. The story was unique enough to keep my attention. There was a decent amount of action and it was an interesting story of the good versus bad variety with some alien help for both sides. In a lot of ways this story seemed like a study in what motivates humans and how they can be influenced especially on an emotional level. The book description does a pretty good job of explaining what the story is about. With regard to readability, I didn’t have any problem getting through it. The story flowed pretty smoothly with no gaping holes. It could be a standalone work as it gives enough background that you can figure out what is going on without too much effort even if you accidentally read the second book before the first one like I did. The writing was good and descriptive. The story was well thought out. Several different characters are followed and the author did a good job with that. At no time was I confused about what was going on or how it all fit together. On the whole I enjoyed it. There were a few places in the story where there were typos/editing errors (or something going on – words out of order) that kind of stopped me, but they were weird like something you would get from a translation program (or so it seemed to me). Not sure what was going on with those, but they just weren’t normal errors you generally find and as always I take off a little for editing problems that make me have to stop reading mid-sentence. Anyway, aside from that it was a solid read. I looked forward to getting back to the story when I had to put it aside. Even with the weird errors I’d recommend it for the price. I noticed that the author has packaged Book 1 and Book 2 (this one) together if you want to pick it up as a single purchase. If you give it a try, I hope you enjoy it as well. 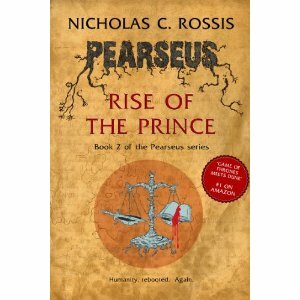 Hi TJ, thank you very much for taking the time to review Pearseus! I apologize for the typos/editing errors (I could have sworn they had all been corrected!) If you don’t mind my asking, when did you download it? I uploaded the latest version a week ago, and am hoping all issues have been fixed. You are welcome. Feel free to send Book 3. I’m slow these days, but will get to it as soon as I can.